I would like to draw a Power Splitter symbol for CircuiTikZ like the one here below but I don't really know where to start. 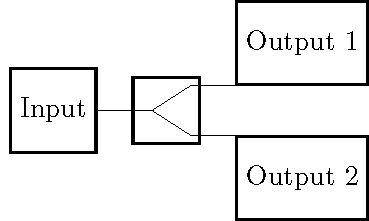 Maybe such a symbol (even not with the "circles" at the input/output) alredy exists? 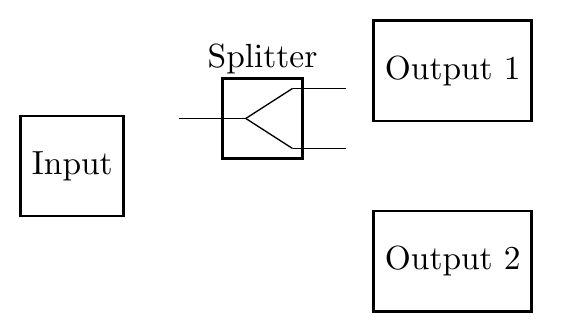 The problem is that including it in a document, it is impossible (or very difficult to connect my splitter to the input/output blocks. %%%% new anchors: "out A" and "out B"
If you intend to use this a lot, you might look into creating a shape. Then you add anchor points and do things like node[splitter,anchor=in] to align the node relative to its input anchor, etc. I have some tutorials on my web site. Not the answer you're looking for? Browse other questions tagged tikz-pgf circuitikz tikz-graphdrawing or ask your own question.